House Speaker John Boehner of Ohio smiles during a news conference on Capitol Hill in Washington, Thursday, Nov. 6, 2014. When the 114th Congress is sworn in on Jan. 3, House Republicans will boast their largest majority since Herbert Hoover was president. If all leaders in the yet-to-be-called races hold their leads, Republicans will go from 234 seats to 247, a triumph that exceeds their “Drive to 245” goal. Not even Republicans anticipated they were in for such a good year. So how did they beat the point spread? The answer lies less in what Republicans did, and more in what Democratic voters didn’t do: show up to vote in so-called orphan states. Political types call these places “orphan states.” In 2011, Republican operatives began using the term to describe worrisome House races in states where the 2012 presidential race wasn’t competitive. Republicans fretted that without a robust GOP presidential campaign driving out their voters in places like California, Illinois and New York, they were in danger of letting more energized Democrats run up the score in down-ballot races. Their fears were warranted; those three states alone produced Democrats’ entire eight-seat House gain in 2012. But in 2014, Republicans took advantage. In a midterm election, heavily Democratic groups such as young and low-income voters and Latinos are less likely to turn out to begin with. And in plenty of states, the lack of a competitive statewide race sent turnout plunging to unforeseen lows and led to down-ballot disasters for Democrats. Take the case of Democratic Rep. Steven Horsford, who represents a highly transient district just north of Las Vegas that’s 49 percent white, 27 percent Latino, 14 percent black and 6 percent Asian. House Democrats were so confident that Horsford, a promising African-American freshman, would be re-elected in 2014 that they didn’t put him in their “Frontline” program, which was meant to steer Democratic donors toward vulnerable incumbents’ campaigns. After all, President Obama had won Nevada’s 4th district by 10.7 percent in 2012. But in mid-October, hyper-alert Nevada political analyst Jon Ralston noticed that early voting participation had skewed much more Republican than it had in 2012, even in Horsford’s melting-pot seat. It made sense: With GOP Gov. Brian Sandoval cruising to re-election and no Senate race on the ballot, there was little reason for Democrats to show up. At the last minute, President Obama cut a radio ad for Horsford designed to boost turnout among the Democratic base, but it was too little, too late: Horsford won fewer than half the 120,501 votes he had won in 2012. Little-known GOP state Assemblyman Cresent Hardy beat Horsford 49 percent to 46 percent. Even places like the Cook Political Report (where I work) didn’t see a few of these races coming. If we compare the actual results of the midterms to how the Cook Political Report rated House races two weeks before the election,4 we can see the orphan state effect in action. Of the 13 Democratic seats that Cook listed as “Toss Ups,” Republicans won eight. Seven of those eight wins took place in states with a competitive Senate or gubernatorial race, such as Georgia, Illinois and New Hampshire. These pickups were to be expected: All eight races had been viewed as great GOP opportunities for months, and had the wave simply stopped there, election night would have fallen in line with predictions. But where Republicans really outperformed expectations was in Cook’s “Lean Democratic” column, which included races like Horsford’s. In those, Republicans managed to pull off upsets in five out of 14 seats. Two weeks out, neither party’s top minds had really expected Democrats in those seats to lose. So how did Republicans beat them? Four of these five unlucky Democrats — Horsford (NV-04), Tim Bishop (NY-01), Dan Maffei (NY-24) and Pete Gallego (TX-23) — were running in orphan states where the lack of a high-profile statewide race caused turnout — particularly among casual 2012 Obama supporters — to tumble far more dramatically than either party had anticipated, and far more dramatically than in other states. “The turnout model we used in our polling had 40,000 more voters showing up,” lamented one bewildered Maffei adviser surveying the wreckage on Nov. 5. In Bishop’s NY-01, the number of raw votes cast for the House race fell about 45 percent from 2012. In Maffei’s NY-24, raw votes were down 38 percent. In Gallego’s Hispanic-majority TX-23, raw votes were down 41 percent. In Horsford’s NV-04, raw votes were down 48 percent. Of course, in 2016, it could once again be House Republicans who need to worry about orphan states that could lead to strong Democratic turnout. But as 2010 and 2014 proved, late-breaking upsets in House races are more likely to sneak up on unsuspecting bystanders in midterm years. When fewer people vote, more surprises happen. 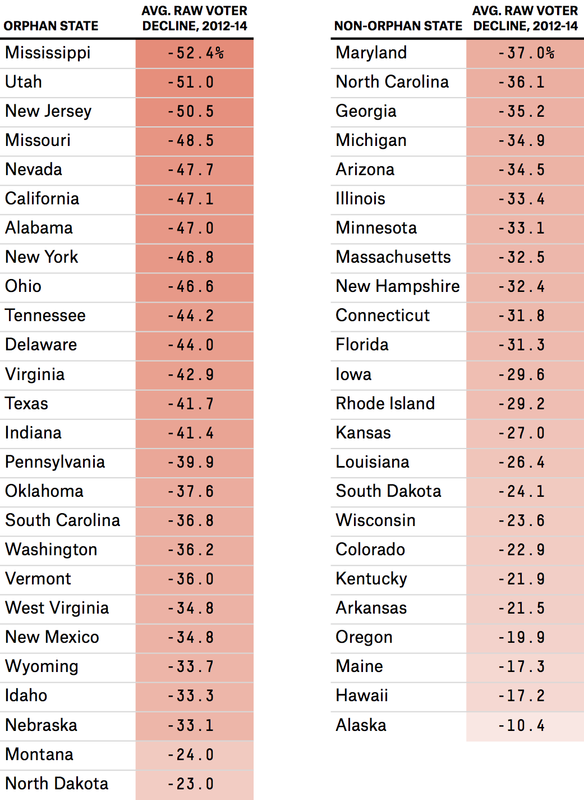 For good measure, here’s a state-by-state index of average turnout declines in contested House races between 2012 and 2014. The first table includes the 26 orphan states without a competitive Senate or gubernatorial election, according to the Cook Political Report’s pre-election ratings. The second table includes the 24 states featuring competitive statewide races in 2014. In 2010, House Republicans beat House Democrats by 6.61 percentage points when taking into account all votes cast for the House. In 2014, Republican candidates are on track to win roughly 6.35 percentage points more votes than Democratic candidates, though that figure is expected to fall. For purposes of this analysis, the 24 “competitive” states included 22 states with Senate and/or gubernatorial races the Cook Political Report considered competitive, as well as Minnesota and Oregon, where both Senate and gubernatorial races were considered marginally competitive. These numbers are subject to change as an undetermined number of absentee and provisional ballots remain to be counted in states such as California and New York. Cook did its ratings on Oct. 22 and based them on off-the-record input from party strategists on both sides.